Orbee was adopted from a Humane Society in a small town in rural Montana. 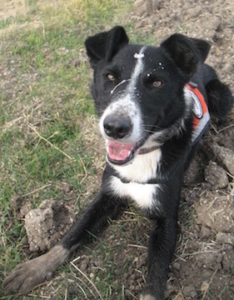 Being a border collie with absolutely no interest in sheep or herding nullified his prospects as a ranch dog. His high-pitched bark, fastidious nature, and intense personality are far from ideal pet traits. 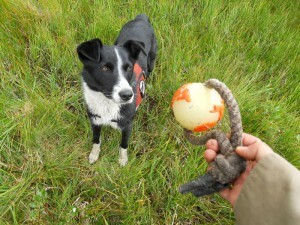 Thanks to those “undesirable” characteristics, Orbee has found his niche as a conservation detection dog and is adored by his handler. He has worked all over the world in every possible environment – from sand dunes in arctic Alaska to African jungles to Montana riverbanks. His meticulous intensity has helped researchers learn more about secretive animals like wolverines and San Joaquin kit fox. He has also been an invaluable asset in the management and eradication of Dyer’s woad, an invasive weed, on a Montana mountainside. While not interested in herding sheep, in his free time Orbee does enjoy herding socks. He is also a master navigator on road trips, a semi-professional snowflake chaser, and an aspiring sous chef. When not busy with those duties or on assignment, he enjoys a good run in a snowy forest followed by a cozy tummy-toasting by the wood stove. To show his love and appreciation to his best friend and handler, he serves as a most excellent foot-warmer on cold winter mornings. And that high-pitched bark? Well, it’s understood as a sign of enthusiasm.